You probably already know male black widow spiders are risking their lives when they go courting—but it’s actually worse than that. They face tough competition for the “honor” of mating. Once a virgin black widow female puts up a pheromone-laden mating web, males run in from all around to try their luck. As a result, the first male to arrive at the web can expect three to six rivals to show up before the long, slow, careful mating process is over. And the more males that arrive to mate with the female, the fewer of her eggs are likely to become his babies. What’s a spider to do? According to Catherine Scott and her colleagues at Simon Fraser University, a little creative redecorating is in order. In many species of spider, males often remove large chunks of female webs before they mate. Black widow males are no different: the first male to arrive at a virgin’s web typically rips out half of her silk strands and wraps them in his own silk. Scott found that this behavior keeps other males from finding the female’s web. 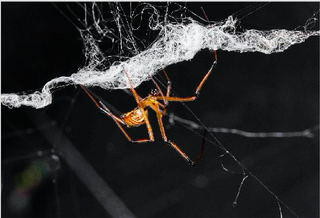 In an experiment published at Animal Behaviour this week, Scott and her team compared how many wild males were attracted to black widow webs that were either untouched, cut up with scissors, or given a male’s cut-and-wrap treatment. They found that although their cut up webs had had the same amount of silk removed as the male-altered ones, they attracted just as many males as the intact webs. The webs that had been altered by males, however, attracted three-fold fewer males. Scott thinks that a male may manage this trick by selecting the most pheromone-rich sections of web to destroy and hide away, or by applying his own counter-pheromones to the strands. However he does it, it seems to be an effective way to keep a female to himself.